Power lines near Airdrie, Alberta. Community generation enables neighbours, community groups, municipalities, agricultural societies, rural and urban co-ops, universities, schools, Indigenous communities and other groups to partner on small-scale renewable energy projects such as wind, biomass, hydro or solar that provide community benefits. 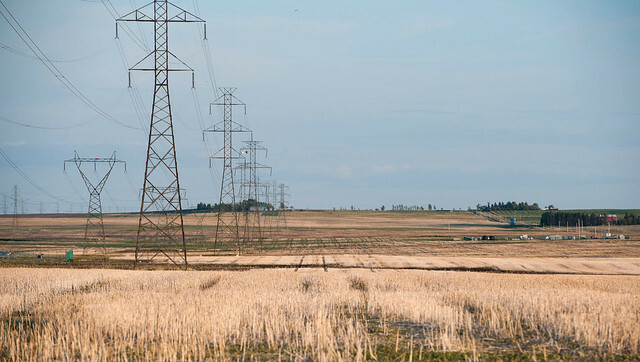 Community generation supports Alberta’s target of 30 per cent renewable electricity by 2030 by helping Alberta transition to an electricity system that is cleaner, reliable and more sustainable. The Community Generation Program is made possible by Alberta’s Small Scale Generation Regulation, which outlines new rules to enable small-scale and community projects, including definitions, setup and operation. These rules also help reduce regulatory and financial barriers for generators.